Can't bike into town, because of all the rallies mucking things up. Can't take Metro anywhere, between rally-goers and trackwork on the Yellow Line. Can't go east cause 50 is all ripped up. Can't go west cause 66 is single-lane at the Beltway. Can't go north cause it's too late to get out. Can't go south cause 95 is...95. 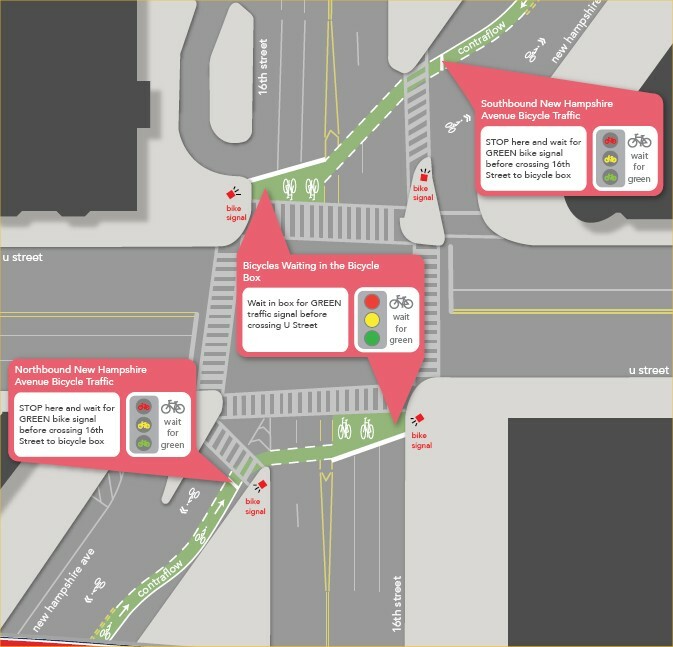 Greater Greater Washington has a post this morning about the new contraflow bike lanes on New Hampshire Ave NW, for a block or so on either side of the 16th/U St intersection. I don't see anything wrong with the intersection layout itself, with dedicated bicycle signals and the bike boxes on 16th St. But the contraflow lanes on the adjacent blocks are some cause for concern. I easily see this creating a higher potential for bike-vehicle collisions given that vehicles will have to cross the bike lane in order to park or depart from the parking lane. There's also nothing really stopping vehicles from using the bike lane as a staging area or outright parking in the bike lane. There's a better overall solution for this case. There appears to be enough width on New Hampshire Ave to implement a full-width bike lane curbside, moving the parking lane back to the "opposing flow side" of the street, with the two sides then being separated by a raised curb or bollards. Greater "dooring" potential (since the bike lane would be on the driver's side and not the passenger's side). Parking vehicles no longer need to cross the bike lane, reducing potential bike-vehicle conflicts. Physical separation of the bike lane from vehicle lanes (parking or travel) further reduces potential bike-vehicle conflicts, plus the possibility of a vehicle using the bike lane for parking or "staging". Full-width bike lane reduces the chance of a "dooring" incident, plus it still allows for snow removal in winter (similar to the 15th St contraflow lane). Bike-ped and "dooring" incidents are generally less severe than bike-"moving vehicle" incidents. Either way, I'm reminded of last year's implementation of bike lanes on 1st Ave N in downtown Minneapolis, MN, which has a little bit of both the new New Hamsphire Ave configuration and my proposed re-configuration. These 1st Ave N bike lanes are curbside, between the parking lane and the curb. But they are also on the passenger side of parked vehicles, with a lower chance of "doorings" than if the bike lane were on the driver's side.